In MASAYA, Nicaragua, hundreds of dogs, many dressed as babies or clowns, were taken to celebrate mass in this Nicaraguan town on Sunday, an annual ritual where the owners pray for their pets to be cured or avoid falling ill.
“We brought him so he does not get sick,” said local resident Nora Espinosa, talking about her six month old Basset Hound, dressed in a soccer outfit. God bless everyone of thier furry little heads! I am surprised that Paris Hilton wasn’t here. Is it just me, or does anyone else find it amazing that our government can track a cow born in Canada almost three years ago, right to the stall where she sleeps in the state of Washington. And they tracked her calves to their stalls. Beagle takes Best of Show in Westminster…UNO is NUMBER ONE! NEW YORK has a new super star and America has a new Snoop doggie. Uno the beagle wins best in show at the Westminster Kennel Club. Barking and baying up a storm, Uno lived up to his name Tuesday night by becoming the first beagle to win best in show at the Westminster Kennel Club. The nation’s new top dog was clearly the fan favorite and drew a standing ovation from the sold-out crowd at Madison Square Garden when he was picked. Uno got right into the act, jumping up on handler Aaron Wilkerson and confirming his other title: noisiest in show. Years from now, he’ll be known for the “ah~roo” heard ’round the ring. The only dog consistently listed among America’s most popular breeds for nearly 100 years, a beagle had never won in the 100 times Westminster picked a winner. That changed when judge J. Donald Jones pointed to this nearly 3 year old package of personality. Good ol’ Snoopy, a champion at last. Uno celebrated his win by chewing on the microphones of reporters who tried to interview his winning crew. More than 169 breeds and varieties were represented at the 132nd Westminster Kennel Club event, and the competition brought 2,627 entries. Barks echoed around Madison Square Garden as the crowd cheered its favorites, among them a Neapolitan mastiff that lumbered around the ring, a Chihuahua that spun in circles and a miniature pinscher that plucked a piece of food off the green carpet without missing a beat. Formally known as K~Run’s Park Me in First, Uno came into this competition with 32 best in show ribbons overall. Yet he was surely an underdog, make that an Underdog, because no beagle had even won the hound group since 1939. But Uno fixed that, breezing in the 15~inch breed judging Monday morning and taking his group several hours later. So while other dogs tried to reach the final ring Tuesday, Uno spent the day going on a brisk walk around Manhattan and taking a nap underneath his warm, fuzzy blanket. But when it came time to show, Uno was as precocious and precious as ever. With fans calling out his name and clapping, he soaked in the cheers as he walked around the ring. And when he made his final stop in front of Jones, Uno went to town, baying over and over. Even when he returned to the sidelines as other dogs were judged, Uno kept going. Quite a win it was for Eddie Dziuk of Columbia, Missouri, and the other three co-owners. Longtime dog expert David Frei, the paw~by~paw announcer for USA Network’s coverage of the Westminster Kennel Club show, went even further. Better get that first rent check ready, Uno is here to stay. What an adorable dog…I used to raise Beagles…I would suggest them for anyone and they are good with kids…city apartments…I don’t know as they love to run! In from SAN FRANCISCO, California, one of the three victims of San Francisco Zoo tiger attack was intoxicated and admitted to yelling and waving at the animal while standing atop the railing of the big cat enclosure, police said in court documents filed Thursday. Tatiana, a 350 pound Siberian tiger, killed one young man and injured two others before being killed. “As a result of this investigation, police believe that the tiger may have been taunted or agitated by its eventual victims,” according to Inspector Valerie Matthews, who prepared the affidavit. Police believe that “this factor contributed to the tiger escaping from its enclosure and attacking its victims,” she said. Sousa’s father, Carlos Sousa Sr., said Dhaliwal told him the three stood on a 3-foot-tall metal railing a few feet from the edge of the tiger moat. “When they got down they heard a noise in the bushes, and the tiger was jumping out of the bushes on him [Paul Dhaliwal],” the documents said. Police found a partial shoe print that matched Paul Dhaliwal’s on top of the railing, Matthews said in the documents. Calls to Sousa and Michael Cardoza, an attorney for the Sousa family, also weren’t returned. Toxicology results for Dhaliwal showed that his blood alcohol level was 0.16, twice the legal limit for driving, according to the affidavit. His 24 year old brother Kulbir Dhaliwal and Sousa also had alcohol in their blood but within the legal limit, Matthews wrote. All three also had marijuana in their systems, Matthews said. Kulbir Dhaliwal told police that the three had smoked pot and each had “a couple shots of vodka” before leaving San Jose for the zoo on Christmas Day the affidavit said. Police found a small amount of marijuana in Kulbir Dhaliwal’s 2002 BMW, which the victims rode to the zoo, as well as a partially filled bottle of vodka, according to court documents. Sam Singer, a spokesman for the zoo, said he had not seen the documents but believed the victims did taunt the animal, even though they claim they hadn’t. Still, the fence was not tall enough…where do you think the blame falls Baby Boomers…taunting young men, short enclosure…or both??? Is the Zoo responsible since the young men where intoxicated with alcohol and marijanna? A long awaited final report from the Food and Drug Administration concludes that foods from healthy cloned animals and their offspring are as safe as those from ordinary animals, effectively removing the last U.S. regulatory barrier to the marketing of meat and milk from cloned cattle, pigs and goats. The 968-page “final risk assessment,” not yet released but obtained by The Washington Post, finds no evidence to support opponents’ concerns that food from clones may harbor hidden risks. But, recognizing that a majority of consumers are wary of food from clones and that cloning could undermine the wholesome image of American milk and meat, the agency report includes hundreds of pages of raw data so that others can see how it came to its conclusions. The report also acknowledges that human health concerns are not the only issues raised by the emergence of cloned farm animals. “Moral, religious and ethical concerns . . . have been raised,” the agency notes in a document accompanying the report. But the risk assessment is “strictly a science-based evaluation,” it reports, because the agency is not authorized by law to consider those issues. In practice, it will be years before foods from clones make their way to store shelves in appreciable quantities, in part because the clones themselves are too valuable to slaughter or milk. Instead, the pricey animals, replicas of some of the finest farm animals ever born, will be used primarily as breeding stock to create what proponents say will be a new generation of superior farm animals. When food from those animals hits the market, the public may yet have its say. FDA officials have said they do not expect to require food from clones to be labeled as such, but they may allow foods from ordinary animals to be labeled as not from clones. Opponents of the approval, including some concerned about the welfare of the clones themselves, expressed dismay upon learning about the FDA’s intentions. Joseph Mendelson, legal director of the Center for Food Safety, a Washington advocacy group that petitioned FDA to restrict the sale of food from clones, said his group is considering legal action. Others countered that public opinion and politics should play no bigger role in the decision on clones than it should in the approval of a drug or a contraceptive. The Food and Drug Administration has concluded that milk and meat from cloned animals, such as these cows, should be allowed on the market. That stance has raised a debate over whether food from clones that are raised organically could still carry the organic label. Release of the analysis was slowed for years by several forces, including the dairy industry, concerned about the potential impact on exports of U.S. whey solids, foreign sales of which are growing for use as a protein supplement. In the past month, as an announcement neared, members of Congress, led by Sen. Barbara A. Mikulski D~Md., sought to delay approval through legislation. Trade related agencies including the Foreign Agricultural Service and the Office of the U.S. Trade Representative, which for years have struggled to get countries to accept U.S. gene-altered crops, also raised red flags. A final blitz of meetings with FDA officials last week brought grudging acquiescence, insiders said. And it is possible, sources said, that even after the risk analysis is released, there will be calls for farmers to voluntarily refrain from selling products from clones until the trade issues can be resolved. To create its final risk assessment, the FDA gathered data on nearly all of the more than 600 U.S. farm animal clones produced and hundreds of their offspring, as well as many from overseas. But it faced challenges in the process. Those animals were made by scientists scattered among various universities and companies using different methods that in many cases were difficult to compare. Moreover, many of those animals were not just clones but also had genes added to them for projects unrelated to food production. In those cases, it was difficult for FDA reviewers to decide whether any problems were caused by those animals being clones or by their particular genetic alterations. The FDA has said it will not approve gene-altered animals as food without additional tests for safety. Finally, there was the overarching problem of deciding which measures would best predict whether the food was safe. Most puzzling was whether to take into account the subtle alterations in gene activity, called epigenetic changes, that are common in clones as a result of having just one parent. In the end, facing the reality that epigenetics have never been a factor in assessing the wholesomeness of food, agency scientists decided to use the same simple but effective standard used by farmers since the dawn of agriculture: If a farm animal appears in all respects to be healthy, then presume that food from that animal is safe to eat. Scientists inside and outside the agency studied thousands of pages of veterinary reports describing weight, size, organ function, blood characteristics and other measures of clones and offspring. For cattle, the animals for which the most data exist, full health assessments were conducted for each of five different stages of the animals’ life: fetal, newborn, juvenile, sexually mature, and old. They concluded that newborn cattle are often unhealthy, probably because of epigenetic changes. They are usually extremely overweight and have respiratory, gastrointestinal and immune system problems. Cloned pigs and goats are mostly healthy from the start. Studies of cloned farm animal behavior, including mating behavior, also showed them to be the same as ordinary animals. One exception: On one farm, clones showed a peculiar preference not for the surrogate mother that gave birth to them but to the animal from which they were cloned. Scientists also looked at nutrient levels in meat and milk from a few dozen cattle and pig clones and hundreds of their progeny, and compared them with values from conventional animals. They measured vitamins A, C, B1, B2, B6 and B12 as well as niacin, pantothenic acid, calcium, iron, phosphorous, zinc, 12 kinds of fatty acids, cholesterol, fat, protein, amino acids and carbohydrates including lactose. For almost every measure, the values were virtually the same. The few that differed were still within the range considered normal. Separately, the agency looked at studies in which milk and meat from clones were fed to animals for up to 3 1/2 months. There was no evidence of health effects, allergic reactions or behavioral changes. But it found no safety hazards for meat from healthy cattle clones more than a few weeks old, milk from cloned cows, or meat from cloned pigs or goats of any age. “Food from cattle, swine, and goat clones is as safe to eat as that from their more conventionally bred counterparts,” the FDA risk assessment concludes. Looking ahead, the report says FDA is collaborating with veterinary and scientific organizations, notably the International Embryo Transfer Society, to create a database on the health of new clones, which will help the agency track the field as the industry grows. Working with the FDA, the International Embryo Transfer Society is also creating the first manual of animal care standards for clones, to be made available to farmers and the public later this year. What do you think Baby Boomers…are you going to eat it…will we even know…what will the reprocussions be as far as Mother Nature is concerned? Remember and look what hormones has done to our bodies and minds…and they thought that safe as well. Yet since the 50’s we have eaten them in our meats. Vegans…you are safe as far as this one goes! Lucky you! SAN FRANCISCO, California, the two brothers who survived a tiger attack at the San Francisco Zoo were denied help for at least 30 minutes by zoo security who did not take their claims seriously, the brothers’ attorney said Tuesday. Paul Dhaliwal, 19, and Kulbir Dhaliwal, 23, tried to get help for their friend, Carlos Sousa Jr., after unsuccessful attempts to stop a 350 pound Siberian tiger that had attacked Sousa on Christmas Day, attorney Mark Geragos said. According to Geragos, the tiger initially attacked Sousa and Paul Dhaliwal about 4:30 p.m. While Sousa was seriously hurt, Paul Dhaliwal escaped, and he and his brother ran 300 yards to a zoo cafe where they had eaten earlier. But Geragos said the brothers were “denied entry” to the cafe because the zoo was closing. At that point the brothers lost sight of the tiger. The brothers then spotted a female security guard who appeared “diffident” when told of the escaped tiger, Geragos said. Parents of dead teen: “It’s hard to believe” After the brothers talked with the security guard, Geragos said, the tiger returned and attacked Kulbir Dhaliwal before police officers arrived and shot and killed the animal. Zoo spokesman Sam Singer dismissed Geragos’ claims and noted that the San Francisco police have not even finished their investigation. “I never speculate on defense attorney hypotheses,” Singer said late Tuesday in a phone interview. According to police dispatch logs from the day of the attack, someone inside the cafe called 911 at 5:07 p.m. It is unclear when the brothers tried to notify people in the cafe about the attack. The dispatch logs also show that zoo employees initially questioned whether early reports of the attack were coming from a mentally unstable person. By 5:10 p.m. zoo employees reported that a tiger was loose, and by 5:13 p.m., the zoo was being evacuated and locked down. For several minutes, the medics refused to enter the zoo until it had been secured. Meanwhile, zookeepers believed several tigers were loose, and hoped to tranquilize them. “Zoo personnel have the tiger in sight and are dealing with it,” reads a 5:17 p.m. note on the transcript. By 5:20 p.m., medics had located one victim, presumably Sousa, with a large puncture wound to his neck. The tiger was still loose. At 5:27 p.m., less than 20 minutes after the initial reports, the officers killed the tiger. Zoo officials say the tiger likely climbed over the wall of its enclosure, which was about 4 feet below the recommended minimum for U.S. zoos. Well, it looks like the ZOO has some serious reports against them…I imagine it is all going to boil down to how the Tigress got out…and was the security fortress enough….where rules broken by not having more and a higher enclosure, per regulations. It seems there are only two witnesses, and they are the survivors. 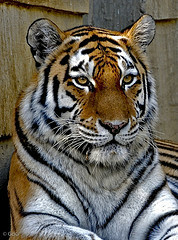 I can not imaginge having a 300 pound tiger attack me, going for my throat. Which would be her primal instinct.